In this article, we explore the idea that we are born with a particular personality type and whether or not it changes over time. Am I Born to be a Certain Personality Type? Much quality research into personality development indicates that our psychological type preferences are inborn, and do not change over time. This research states that there is an innate component to our personalities – that we are simply born a particular way when it comes to our psychological make-up. Just as we are born with a set of physical characteristics that don’t really change over time, our psychological characteristics are equally inborn and don’t really change over time. Now before you start objecting that you are not a static being who hasn’t changed one iota in your life (of course that’s true), this research also indicates our personalities will develop along particular lines depending on those innate preferences. So this is where a little semantic sidebar will help us . The theory of psychological type definitely supports the idea (well more than that, it encourages and expects) that our personality develops over time – but not that it fundamentally changes over time. Our personalities are not “set” and neither is our behavior predictable. But the theory of psychological type is based on the conceptual foundation that people are pattern making, and pattern repeating, in how we take in information, how we decide, how we approach the world, and many other key factors in how we “do life”. Psychological type as a model of human development is built on a dynamic foundation that charts a pathway for lifelong growth and development. This is why psychological type is not static or limiting. It is, in fact, the opposite – it is liberating and expanding. It gives us more choices, not less. This article will explain more about the particular theory of personality we’re talking about: Psychological Type as described by CG Jung. We know that outside factors can influence our personality preferences. For example, we might be born into a family or culture that does not nourish a particular personality preference. When this happens, we can find ourselves with quite well developed abilities outside our natural personality preferences, simply because our upbringing made it necessary. For example, if you are the only person who prefers Feeling (F) in a family of people who prefer Thinking (T) you may be conditioned to find logical support for decisions. If you are the only person with a Thinking preference (T) in a family of Feeling preferences (F), you may learn considerate ways to express your objective analyses. Those are only two of a zillion possible situations where your natural preferences may have been undercut, ignored, undervalued, or in some other way forced underground and your non-preference behaviors have had to develop. In addition to family, outside factors such as culture, education, work settings, geography, values, life experiences, and even birth order can influence our expression of personality preferences. There are many factors which influence our identity and our growth. Psychological type is just one of those factors. Some people therefore may find it harder to identify what their innate preferences are as opposed to what others believe they should or expect them to be. And this is also why discovering your true innate personality preferences can be so powerful, at any stage in life – it brings you “home” to who you really are. Especially if you have had a lot of early conditioning that is in the opposite direction to your natural preferences, it can feel like a massive relief and an extraordinary gift to recognize that your natural way of being is not only just fine – it’s perfect! That your way of being doesn’t need to be curtailed or adjusted all the time – that who you truly are is who you can truly be. This kind of statement – I used to be a Feeler but now I’m more of a Thinker… or I used to be much more Introverted but now I’m more Extraverted — is quite common. People can hold the view that they used to be a particular personality type, and now they are something quite different to that. Whenever we hear this, a few thoughts spring to mind. One obvious possibility is that the first personality typing profile you received was incorrect. For example, if you ‘came out’ an ENFP when you first did a psychological type assessment (eg the MBTI®) way back when, but now you really believe you’re an INFP. This is a situation where one exploration would be that you never had preferences for ENFP in the first place. That for whatever reason, your true natural preferences were not discovered when you first did a personality profiling exercise. And that your preferences were always for INFP – you just didn’t know it. There are many reasons why someone can be mis-typed, and most of them can be linked back to the conditions and mindset the person was subject to and in when they completed whatever questionnaire, survey or self-selection process they undertook to get their ‘letters’. SIDENOTE: That’s all your profile results ever reflect – how you respond to the questions/question areas put to you… if those responses reflect who you innately and truly are, your results will be accurate and feel like “you”. But if those responses don’t reflect who you innately and truly are, your results will only reflect who you were ‘being’ in the moment you took the survey, questionnaire, or instrument; and this may not feel like “you” much at all. This is why people can experience (often wildly) different results when they take personality profiling tests multiple times – they’re not responding as they innately and truly are, just who they were required to be in that moment – a state of being often subject to many mood and circumstance (contextual) factors. For example, taking a personality instrument at work can result in many people selecting themselves as having a preference for Judging (J), as that’s often what is expected in the world of work: a scheduled, methodical, planned, organized and ordered approach. Or you find disharmony difficult and without understanding why that is, you have parlayed that into believing you prefer Feeling (F) without understanding that many people with a Thinking (T) preference also avoid disharmony – but for quite different reasons F people avoid it. These are two of a plethora of possibilities when it comes to ways in which it’s possible to mis-type yourself. Worth remembering that just because you have a skill in a particular area doesn’t automatically translate into that being an innate psychological preference. The model of psychological type, as described by CG Jung, not only allows for but expects that human beings will develop over time. That persons who are psychologically healthy will seek balance within themselves by drawing on the opposite of their natural preferences from time to time (eg: Extraverts need time alone for balance – they don’t need it the same way (or quantity) Introverts do, but they still need it to maintain a healthy psychology). Needing the opposite of your natural preferences does not mean your psychological preferences have all of a sudden (and fundamentally) changed, it just means you’re healthy! Well, no. Through the lens of a healthy development of personality, what this more likely means is you have learned to Extravert when appropriate, and are aware of when you are in “Extraversion mode” (you may even have an elevated self-awareness around when and in what way’s your Extraversion is impacting others). And equally you’ve learned to access your inner world for reflection when appropriate, and when you need to be in “Introversion mode” for balanced well-being. This is called healthy development and maturity, not a change in personality. Unlike toddlers who can’t control their use of these preferences, mature people spend an appropriate amount of time acting and interacting in the external world (Extraverting), and an appropriate, though not necessarily equal, amount in solitude and reflection (Introverting). As a model for lifelong self-discovery, psychological type can’t be beat. It offers a pathway to becoming more of who we truly are, in all our glory. Psychological type, as a model, encourages us to develop and become more of who we truly – and naturally – are. Especially if we have been bending ourselves to fit the shape of things and people around us – other people’s expectations and needs, our environment, our work situation and our home situation, our geography, all the many factors that have had to be catered to, all of our lives – “coming home” to who we truly are can be like taking the mask off, taking off someone else’s costume, stepping out of someone else’s house – and inhabiting our own space, our own skin, our own clothes, exactly as we are. It can feel like a gift of extraordinary proportions. Can I Change my Personality Type Preferences? Yes, you could, with some effort and possibly difficulty, work to develop behaviors outside of your innate, inborn personality preferences. Just as you can learn to write with your non-preferred hand if you needed to, you can learn many behaviors that do not come naturally to you. This begs the question: why would you want to “change” your personality? It’s one thing to develop a range of necessary, required behaviors to get along in the world, or to perform your job well, or sometimes even to make important relationships work. This is all part of life and developing as an adult on planet earth. But developing a range of necessary behaviors is not the same thing as actually wanting to change, at your core, who you are. It’s also worth noting that natural developments of our personality as we age, such as becoming more resilient, socially conscious or wanting to develop our spiritual or creative side, is also a part of what is considered “normal”, and expected, progression through life. These developments in your interests, focus and attention do not mean your psychological type preferences have changed. When you understand the depth and beauty of the theory of psychological type, you realize it makes most sense to concentrate most of your energy on working from a foundation of what comes easiest to you… To work with your natural preferences, to use them as a solid platform for both growth and personal stability… To learn more about – to enter a journey of self-discovery about – your preferences rather than “tick and flick” (get your four-letter type but then forget it). Knowing that your psychological make-up is stable and hasn’t, in fact, “changed” is very freeing. Psychological type offers a rich pathway for personal development, it is a lifelong tool to use to grow, develop and become more of who we really are. And when you truly understand the nature of psychological type — how it expands your choices rather than limits them, how it offers a lifelong pathway for self-discovery, how it holds up the truest mirror you could ever wish to find — then there is no need for you to consider that your personality preferences have fundamentally changed. You can claim and fully own your psychological type preferences knowing they in no way limit you. Quite the opposite – they offer you a safe and stimulating pathway for lifelong insight and growth. Type dynamics is the term given to describe the lifelong pathway that Psychological Type offers for self-discovery, growth and development. You can read more about that here. Your personality preferences celebrate who you are. No preference or personality type is better than another, just different. We are all gifted in different ways, and the best type to be is the one you were born to be! Personality type is an excellent framework for lifelong self-discovery and development. How? For a start you can start simple: Look at areas where other people with your personality preferences have both excelled and struggled and read about their insights into those trouble spots. From there you can apply: Put the information to use in working on your own blind spots or challenge areas. For example, someone with a preference for Perceiving (P) who constantly struggles to finish projects might learn to set deadlines for each step of a process rather than focusing on a single completion date; an approach that those with the opposite preference – Judging (J) – usually find comes naturally and easily. A person with a preference for Introversion (I) may reflect on whether speaking out earlier may be more appropriate and effective in some meetings to ensure their viewpoint is heard; something their psychological type opposite – those with a preference for Extraversion (E) – rarely have to think about but simply do. Those are two out of an almost infinite array of possible ways in which we can use psychological type as a framework to develop, to grow, to adapt, and to become better. This development, growth, adaptation and becoming better is part of a healthy psychological framework, and is a normal and natural part of growing older and becoming more of who we are. It doesn’t mean our personality preferences have fundamentally changed. Want to discover your innate personality – and style – type? Our custom-made and innovative Best Fit Type Process will guide you, through video, text and self-selection, via an affirming and illuminating pathway to discovering more of who you are. 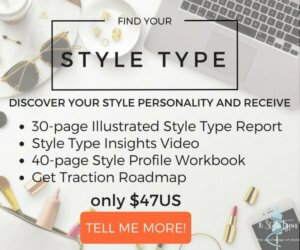 And at the end you will be presented with a sumptuous 30-page Style Type Report to use as your lifelong guide to style and self-discovery. Discover your style type now. What Is Psychological Type Anyway? Why Create a New Way to Discover Your Psychological Type?